1989 kicked off with Australian sweethearts Kylie and Jason topping the charts with Especially for You. 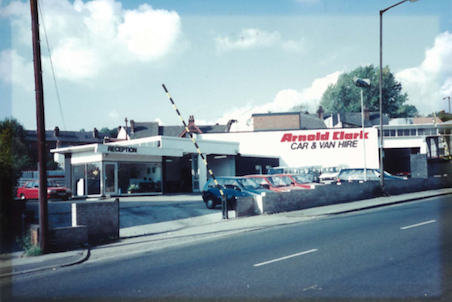 Then, in the January of 1989, Arnold Clark opened its very first branch in England - what a start to the year! The Arnold Clark Car & Van Rental branch in Sheffield is now celebrating its 30th birthday and has big plans to celebrate. Arnold Clark Car & Van Rental moved to England! In 1989, we ventured south of the Scottish border and opened our very first branch in England. Arnold Clark was already well-established in Scotland, so to take on the English market was a pretty big deal. This January, the Arnold Clark Car & Van Rental branch in Sheffield is celebrating its 30th birthday! To mark this special occasion, staff at the branch are raising money for a very exciting local project. The year 1989 was also fairly life-changing in other ways, too. While working in Switzerland, British-born engineer and computer scientist, Sir Timothy Berners-Lee, came up with the idea of the World Wide Web. The first communication via the internet took place in the November of 1989. The Boy Who Lived, or Daniel Radcliffe as he’s otherwise known, was born on the 23rd July 1989. The English actor played the role of Harry Potter in all seven movies of the franchise, giving us muggles hope that one day we could attend Hogwarts. We can’t imagine any other actor taking on the role of the nation’s favourite boy wizard. The Nintento Game Boy launched. Gamers across the world were celebrating the launch of the Nintendo Game Boy in 1989. The handheld console was a first of its kind and brought video gaming into the mainstream. Since its launch in the April of 1989, Nintendo has sold over 150 million units worldwide. We were introduced to The Simpsons. In 1989, we welcomed an unconventional and bright-yellow skinned family of five into our homes for the first time. The Simpsons first aired in the December of 1989 and the never-aging Homer, Marge, Bart, Lisa and Maggie are still as popular as ever. The animated comedy series is now in its 30th season with a prime daytime TV slot. What a year 1989 was! Stay tuned for more information on how Arnold Clark Car & Van Rental will be celebrating the Sheffield branch’s 30th birthday.